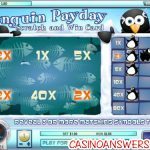 To play Penguin Payday, select your bet of $0.05, $0.10, $0.25, $0.50, $1, $2, $5, $10, $25 or $100 per game. That’s right, you can as little as a nickel or you can bet as much as $100 on a scratch card game. Once you choose the proper bet for your tastes, hit the “New Card” button. Then, you can either hold down the left mouse button to “scratch” the scratch card or you can hit the “Reveal” button for quick play. 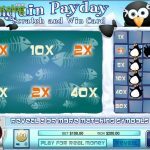 To win on the Penguin Payday instant win game, all you have to do is match three of the six symbols. There are six different multipliers for you to match – 1X, 2X, 5X, 10X, 40X and the top jackpot of 80X. 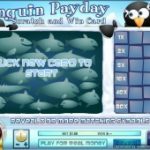 As one can expect from a scratch card, Penguin Payday is an easy game to play with a cute theme and is enjoyable (provided you enjoy scratch cards). Rival is often underrated when it comes to the presentation of their casino games, which can make a game stand out and make it more fun.